…..all villagers who hail from one of the intelligent part of country, gathered during evening hour, to discuss their day to day chaos. The problem in hand today was that each of them had small money each day but did not know how to make best use of it. The money was so small individually that none of the scheme accepted that money as investment. The Panchayat decided to form a Group who would solve this problem. The Group immediately proposed the solution. Let’s combine the money, and invest this money and return shall be divided as per the proportion of investment. Villagers hooted…. Wow good solution, but where would you invest the money? The group had some knowledge that money could be invested in shares as but had a faint idea about it. Someone suggested lets lend the money to someone and earn interest on it. But overall no one had the knowledge, so they decided to contact a wise person in city who was well versed in the field of investments. So this, Wiseman accepted the challenge and came to the village. But FEW VILLAGERS had some doubts on this idea. Firstly, who would keep a check on the learned person and how they know that their investment is making money or running loses. The concerns were genuine and again the Group started thinking. They came out with Rules on investing the money. The Wiseman had to take a prior approval from the group before investing and a few other rules on managing the money. But second concern still remained, which was solved by the wiseman himself. He said each day I would calculate & declare the value of investment at a fixed time. The scheme was launched and the news spread to all parts of country. People from other villages were also allowed to join. Soon the group realized that they had to manage the record of so many people and solve their queries. They appointed a team of literate people and called it Record Team who would just keep the record of the investors. 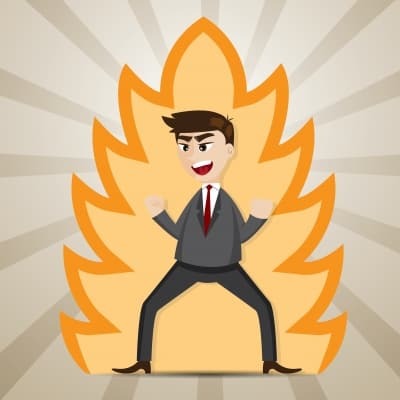 Now the learned man complained that his entire day into managing the investments, taking care of the investments or getting the investments to the village or to send the invested assets to the seller. Another team was appointed to assist him. This was called the Caretaker Team. Up till now the group was managing this show on funds issued by the Panchayat. But, now Panchayat told the Group, since the scheme is a hit why don’t you start charging fees from the investment and earn on your own. This was a good idea Group laid rules for charging the Fees on the investments. And through these Mutual efforts the villagers of this country had a prosperous life. Actually through this analogy, we have just understood how a Mutual Fund works. As the name say, it is a mutual way of investing in Markets. They emerged because of two concerns faced by the Investors. First was the Quantum of investment, as people had small money to save on day to day or month on month basis(5 Reasons to invest Systematically). Second was the knowledge part as each of us have different education and profession, so we find our selves ill equipped when it come to investment Markets. So each of us need the experts help during the investment process. 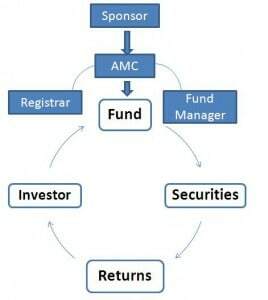 In the above story the villagers are each of us and the Group is the Asset Management Company(AMC), who runs the entire affairs of the mutual fund. Since this group is appointed and answerable to the Panchayat , the Panchayat is the Sponsor of this Mutual Fund. The Wiseman appointed, is the Fund Manager and his team who would take decisions in investing in different asset classes. The Rules laid are nothing but Objectives, which are set for each schemes and the basic guidelines about the investment made under the scheme(Fund). The Value of investment that the wise man is reporting is the Net Asset Value or the NAV. NAV is the unit value of the asset and is calculating by dividing the assets by the numbers of unit holders. The Record Team is Registrar & Transfer Agent or R & T for short. They keep the record of the investors and take care of the queries of the units holders. And finally, the Care taker Team is the Custodian, who shoulders the responsibility of keeping records and possession of all the physical asset of the scheme. And Fees that the scheme is charging are called the Asset Management Fees. All villagers were Investors. Simple… isn’t it? Now, through the picture you can very well correlate the working of the mutual fund. Now let’s discuss the benefits of investing in mutual fund. The biggest advantage is the Diversification. Each units holder contributing in small proportion becomes the owner of a large portfolio comprising of different assets. He therefore minimizes his risk by dividing his investments in many securities. Other advantage are, though mutual fund you and expert managing your investment. Also you can invest in small amounts. Since this is a collective investment, the cost of management is very low and most important the liquidity aspect. Mutual Funds have schemes as per the time horizon of your investment. So you can get money back when the need arises. 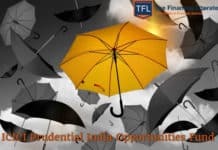 In subsequent series, we shall learn more about Mutual Funds benefits, types and how to choose & invest in these schemes. It’s our pleasure to receive comments from a person who is pioneer in Personal Finance Training. Great… superbly explained… Thanks… It will surely help.. Very good explanation in very simple language. Its beautiful article. Its so simple. i have started thinking more positively @ investing in mutual funds. A Very good explanation in simple language .Apreciating for the hardwork. From your question it seems that you are planning to build your retirement corpus. If we assume a rate of 15% you need to invest Rs 2250 per month to build required corpus. You can start with Rs 2000 & after 5 years when your income increases – you can increase your contribution to Rs 2500. 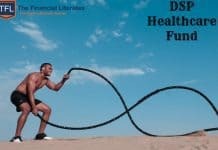 If you are already having some other investment you can start Systematic investment plan in diversified equity mutual funds like HDFC Top 200 Fund & DSP BR Equity Fund. If this is going to be your only investment start contributing Rs 500 in PPF & rest through SIP. Thank u for this great explaination & it was very easy to learn (impressive). Thank u once again. If you like something always share it with friends. In India less than 2% people understand about Mutual Funds. I want to know about SIP (Periodic Investment). Also what is the procedure to start the Mutual fund, Whether we need any dmat account for that. Can u explain about esilver and egold. To start with I will suggest – you should invest in 2 large cap mutual funds like HDFC Top 200 & DSP BR Top 100. No need to open demat account for this; just search for any mutual fund agent in your area or directly go to these mutual fund cos. in your city. Right now you should not go gold or silver investments. Is that safe to start an account through online MF platform. There is no definition of safety – even biggest bank collapsed & best of the cos. did fraud. But you can still choose them to invest your funds. Well articulated .Lucid language . Finally I got an opportunity to go through your articles and must say that I’m glad I did! I have been receiving your emails and appreciate the way you put across the information. You are doing a good job – Keep it up!! Thanks Jaswinder – you can also contribute in financial literacy movement by sharing articles with your friends. My age is 39, i want 20 lac Rs in 15 year .pls tell to me. Where I do the invest & how much I need to Invest my money. please tell to me any company s plan and schemes. As everyone says your articles are good, Iam no different. Though Iam reading your articles for the past 3 weeks. This is my first comment. You are doing a wonderful job. Keep it up. You can start it in any 2 diversified equity funds – you can choose DSP BR TOP 100 & Reliance Regular Savings Equity Fund. All these days, i never understood the meaning of mutual funds, as i am not from finance background. But, after reading this article, it is much clear to me. Really it is a very good work. Plz go ahead. Very well explained. I think SIP is a better method of investing into a MF than an lump sum investment. So simple to read and so easy to understand. It was really a good lesson on Mutual Fund specially for a person from Non Finance bachground after reading this i am planning to invest in Mutual Fund but please let me know how to start with investing in MF and how to decide which is best MF in the market…. You can consider investing in ELSS i.e. equity linked savings scheme from mutual funds.You can invest through SIP. 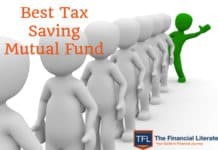 The other good option is PPF if you wish to do a long term recurring investments.It will save you tax every year and proceeds are tax free including interest. I dont know anything about mutual funds equity but after reading your article i find easy to understand it. your way of communication written is too good i can understand this English. I was search other site also but there i find it difficult to understand .But thanks to you example and easy readably English i can understand lot in it . Fantastic explanation of Mutual Funds to Village and I really liked it. You have explained in very lucid language that everyone can understand. This basic knowledge is enough to dive into Mutual Fund. Keep up the work and all the best !! Whatever I praise you for this article It will be very less since it has been drafted and covered about mutual funds in a so simple manner and can easily understand by layman specifically who are from non financial background. Thank you so much for such good article! Excellent , explained in simple language.